Enter into an authentic railroad depot and take a step back in time. Here you will find books, artifacts, pictures and vintage clothing of Mercer since it was established in 1894. Mercer became organized as a town in 1908. The Depot Museum is open weekends only from Memorial Day weekend until the 3rd weekend in June; thereafter it is open daily through Labor Day weekend and after Labor Day only on the weekends again through the end of September. Hrs: June: Fri & Sat 10am-2pm. July & August: Mon-Sat 10am – 2pm. Sept: Fri & Sat 10am – 2pm. 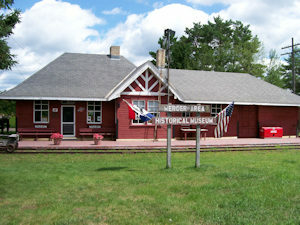 The Museum is located on Railroad Street one block off Hwy 51 downtown Mercer.